Living Wealth partners with a network of trusted, highly professional associates who are experienced in delivering tangible results and superior levels of service excellence within their respective specialist fields. Upon consultation with our client, Living Wealth will identify the participation of a specialist according to our client's individual operational requirements. The Natural Step is a not-for-profit organisation dedicated to education, advisory work and research in sustainable development. Since 1989, TNS has worked with thousands of corporations, municipalities, academic institutions and not-for-profit organisations that have proven that moving strategically toward sustainability leads to new opportunities, reduced costs, and dramatically reduced ecological and social impacts. The Natural Step Framework is a proven, scientifically robust model that helps organisations make pragmatic decisions to move toward sustainability. TNS researches the science of sustainability and links it to real world applications. TNS creates dialogue about the opportunities and challenges in building a sustainable future, accelerating change toward sustainability. The Green Leaf Environmental Standard measures environmental and social indicators key to sustainability while inspiring environmental and social change through education, awareness and continual improvement aimed at owners, management, employees and consumers alike. The Green Leaf Environmental Standard and the Green Leaf icon are owned by the Wilderness Foundation, South Africa; a public benefit non profit environmental organisation with 50 years track record in environmental leadership, conservation and social award winning projects. The appointed administrator and licensor of the Green Leaf Environmental Standard is the Green Leaf Environmental Trust located in Port Elizabeth, South Africa. The beneficiary of all Green Leaf Environmental Trust service offerings is the Wilderness Foundation, South Africa. The Green Leaf Environmental Trust has an appointed Board of Trustees which is governed by statutory and acceptable accounting practice requirements of the Republic of South Africa. The group of Jeffares & Green (Pty) Ltd, with a staff complement of more than 230, has been responsible for the design and construction administration of more than 5000 projects since its inception in 1922, operating from thirteen centres in Southern Africa. In 1997 J&G began an ongoing transformation process and has been independently assessed and verified as a contributor on the Broad-Based Black Economic Empowerment (BBBEE) industry score card. In September 2000, Jeffares & Green obtained ISO 9001 certification for its quality standards for all its offices in South Africa. Jeffares & Green’s Environmental Discipline consists of a staff complement of more than 15 environmentalists country-wide with competencies in Integrated Environmental Management, Environmental Impacts Assessment, Environmental Management Systems, Environmental Auditing, Water Quality, Waste Management and Geotechnical Specialist Services to name a few. The firm, which initially specialised in rail and road transportation, now also includes specialist companies that operate in the fields of geotechnical and environmental services, pavement technology, traffic and transportation, water management and social development. Ecospecifier global GreenTag™ BIM based life-cycle assessment product certification program assists green designers and building professionals by cutting product research time in product specification and procurement. ecospecifier’s GreenTag GreenRate Certification Program is recognised by the GBCA and GBCNZ as a third party certifier for Green Star™ Materials Calculator credits in Australia and New Zealand and also provides expert technical opinion on how products support global Green Building rating schemes such as LEED, BREEAM, Estidama and others. Certified products are listed on www.ecospecifier.com.au and powerful Green Building Rating Tool Search functions make finding products that comply with the credits being sought fast and easy. 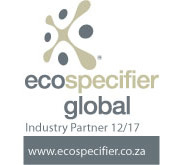 With well over 6000 products online, ecospecifier.com.au and GreenTag™ are the natural green building support tool and recognised green building product certification system for Australia and beyond. Furthermore, we have a network of preferred suppliers that can carry out specialist tasks or installations, specific to a client's requirements such as renewable energy, water treatment or waste management solutions.